NEW!! The Clamco Model R1275 Rollbag uses the latest technological innovations to give the highest throughput speed for a tabletop bagging system. The dry cycle speed is up to 60 bags/minute with a feed rate of up to 30 inches/second. The R1275 features a color touch screen interface that makes it very user friendly and easy to learn. 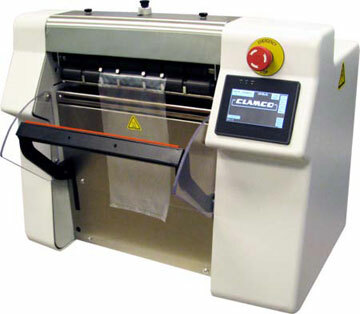 The Clamco R1275 is easy to install and supports a wide range of size and mil thickness pre-made bags-on-a-roll. Utilizing the very latest PLC technology, the R1275 is a very reliable and easy to use automatic bagging system. The PLC touch screen control allows operators to quickly setup or recall packaging jobs, and also displays diagnostic help tools. The Clamco R1275 is easy to install and supports a wide range of size and mil thickness pre-made bags-on-a-roll. This table-top bagger can process poly, food grade and anti-static bags-on-a-roll at speeds up to 60 per minute. The R1275 rollbag offers a variety of options such as a sorting table, product feed funels, articulating bag support tray, foam pad air expeller and in-line printer for printing bar-codes, graphics and variable text directly onto the bag. Min./Max. Bag Width: 2" to 11"
Min./Max. Bag Length: 2" to 12"
with color touch screen interface. NEW!! You can now get the Clamco R1275 integrated with a scale on a unitized stand to form a complete automated packaging system. FOB: Factory, Cleveland, Ohio. Units usually ship in 3-5 weeks.